Throughout the Fall and Winter, your swimming pool or hot tub covers can collect a lot of water on top of them. Standing water can become very filthy and full of contaminants, here at Sunny’s Pools and More we have cover saver pumps. 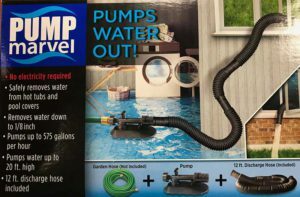 These pumps make it easy for you to remove standing water from your covers or just about anywhere. We carry all the top brands of cover saver pumps, such as Cover-Care, Hydrotools and Pump Marvel. All these pumps are great options for removing standing water. If you have more questions about pumps please visit and talk to our experts at any one of Sunny’s Pools & More’s 5 great locations! 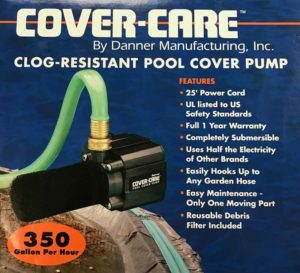 The Cover-Care pump is a clog-resistant pool cover pump that can remove up to 350 gallons an hour. Some other benefits of the Cover-Care are a 25-foot power cord and comes with a full one year warranty. The pump is completely submersible as well as using half the electricity other brands use. In addition, it has a reusable debris filter and it easily hooks up to any garden hose. The Pump Marvel works by using the pressure from a garden hose. No electrical parts are needed for this pump, just a working garden hose. Flooded basement and no power? The Pump Marvel can help you with that. With the Pump Marvel, you can pump hundreds of gallons of water from anywhere in no time. Designed to easily remove water from pools and hot tub covers, it can remover all the way down to 1/8 of an inch. This pump comes with a 12 foot discharge hose and can pump water up to 20 feet high. 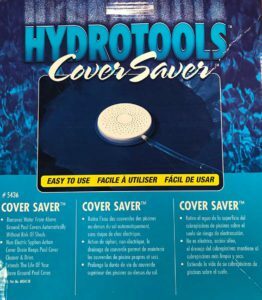 The Hydrotools Cover Saver can remove water from swimming pool and hot tub covers in no time at all. This cover saver pump uses non-electrical siphon action. Swimline has been an established name in the pool industry since 1971. Their quality products are always a great investment to prolong the life of your swimming pool or hot tub. 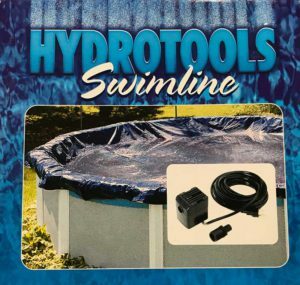 The Hydrotools Swimline electric pump helps remove standing water quickly from your pool covers. Depending on the model you choose, they can remove up to 250 to 500 gallons of water an hour. It comes with a 25 foot power cord and can remove water up to a 1/4 inch. This pump has a foam screen to help block debris and has a garden hose adapter.